Real estate chatbots are the #1 way to automate your lead response and grow your business. Chatbots are more reliable than a human and the daily cost is less than a cup of coffee! Respond to leads 24/7, even when you’re asleep or helping other clients. Reduce the number of daily interruptions by automatically handing repetitive client requests. And then email you the details. Generate referrals and ask visitors if they know anyone looking to buy or sell ! Reduce your payroll costs and handle multiple leads at the same time. There are massive benefits available to agents who deploy a real estate chatbot now, before every other agent jumps on board. So read on to learn more! How Does a Real Estate Chatbot Work? 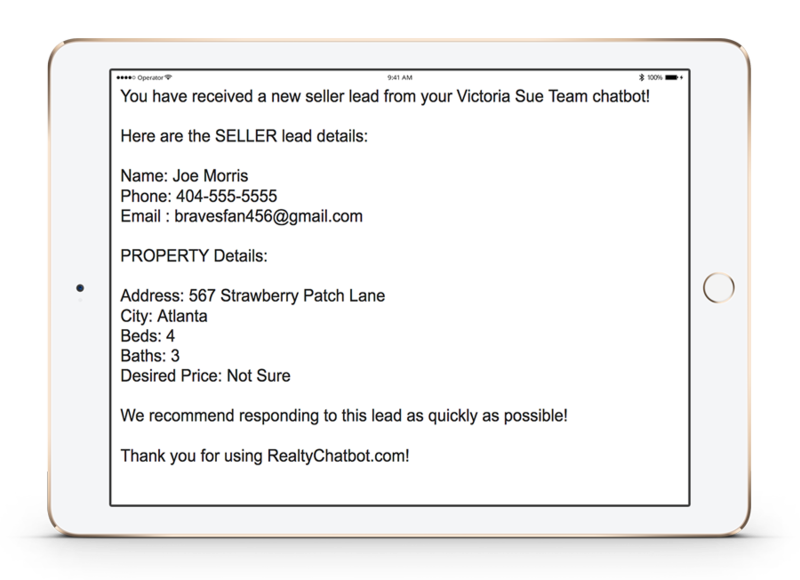 A Realty Chatbot is a computer program that is running 24/7 to respond instantly when a client or lead needs something. 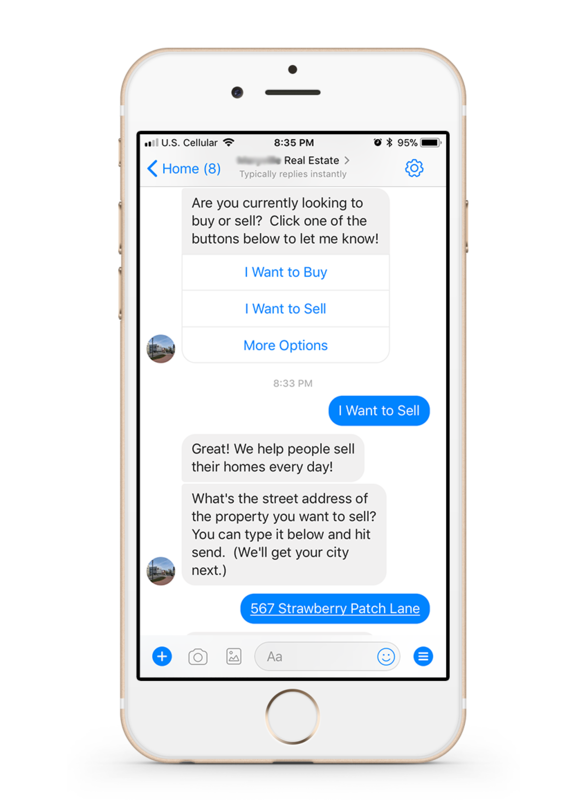 Real estate chatbots can be deployed on Facebook Messenger, your Facebook Business Page, and even your personal website! It’s easy for leads and customers to start a chat! They either click the ‘Send Message’ button we add to your Facebook Business Page, start the chat via Facebook Messenger app, or use the chat box that we can add to most websites. Realty Chatbot has one of the most advanced real estate chatbots in existence. There are a variety of conversation flows that kick-in based on what your chat visitors need and how they respond. This is made possible by Artifical Intelligence (A.I.)! You receive an email containing the name of the lead, their contact details, and relevant details of the chat. (This happens the second contact information is provided.) Details include responses to questions and text responses from your leads. I’m Convinced, Sign Me Up! What Can a Real Estate Chatbot Do? Lots of things! It can convert buyer and seller leads, generate referrals you might have otherwise missed, relay messages from clients, and new features are being added weekly. We know listings are the lifeblood of your business. Seller leads are automatically routed to the home valuation conversation flow. This allows sellers to quickly and easily provide details about their home. Our first buyer conversation flow is designed to collect the home search criteria of buyers who are just starting their search. Obtaining this info allows to build a saved MLS search and keep the lead hot. Showing requests are our second buyer conversation flow. When buyers request a property showing their immediate need has been met and they are less likely to move-on to other agents. Referrals are critical to growing your business and client base. That’s why we made sure to design a referral module capable of obtaining new referrals that you might otherwise miss. Users will see the option to ‘Refer a Friend’ at just the right time! It’s easy to generate tenant leads that you can work or refer to property management agents! Another benefit for agents who don’t work with renters is that it prevents your day from being interrupted. Turn commercial real estate leads into new clients, or refer them to a commercial specialist! Either way you make money and benefit from additional transaction volume. Easy money! And more conversation flows are in the works! Can a Real Estate Chatbot Save Me Time? You probably figured this one out by now, but automating your lead response frees up your time so that you can focus on other things. Even your personal life! Handle Multiple Leads at Once! You can only handle one lead at a time, but your chatbot can handle multiple leads at once! Stop juggling phones and missing out on your hard-earned leads! Time wasters and poor-quality leads can really eat into your day. But it’s even worse when the interruption isn’t relevant to your niche. Lead screening to the rescue! Can I Customize My Real Estate Chatbot? Of course! 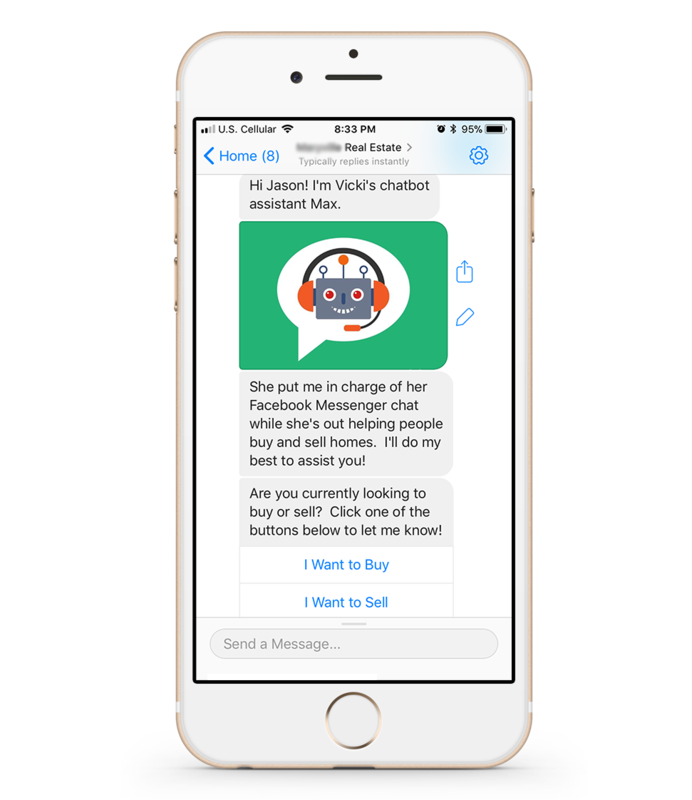 All of our customers have the chance to name their chatbot assistant and provide their own conversation photos if desired. In addition, we have several premium customization options available for agents who want even more control over their bot. I’m Ready, Build My Chatbot!